I like Ocean’s Eight. I like its exuberance, its stellar cast, its slick plotting and its silliness. It looks great: as polished and meticulously groomed as the A-listers at the Met Gala, where the eponymous Debbie Ocean (Sandra Bullock), sister of the franchise’s previous lead, masterminds an audacious jewellery robbery. What’s not to like? Well, it’s just another heist movie, albeit a well-told one – a slice of polished nonsense, not particularly memorable. And it’s VERY American in its glorification of the maverick, a veritable celebration of outlaws and their crimes. Can you imagine a British film on a similar subject where everything runs so smoothly, where the thieves are as sympathetically presented, where no one bungles anything? Ocean and her team are almost super-human. All that talent – it’s a shame it’s wasted stealing sparkly stones. But still. It’s great to see this fine group of actors given the chance to have some fun, playing roles that are strong, cool, funny and exciting. They don’t have to be seductive or damaged or any of the other limited options usually available to mainstream-movie women over thirty. (Of the eight, only Awkwafina is still – just in her twenties: Anne Hathaway, Rihanna and Mindy Kaling are all in their thirties; Cate Blanchett and Sarah Paulson in their forties, and – almost unbelievably – Sandra Bullock and Helena Bonham-Carter are over fifty now. How did that happen?) They all look like they’re having fun, especially Blanchett, razzing around on her motorbike, exuding charisma. The plot’s a pretty simple one, even if the plan within is fiendishly complex. Debbie Ocean has been in prison for the past five years, and has spent her time conceiving every detail of this heist. She wants to pull off this crime, not just for the riches it will afford her, but for the kicks, and to live up to her family name. If she can exact revenge upon her ex at the same time, well, why wouldn’t she? So she looks up her old ally, Lou (Blanchett), currently engaged in watering down vodka at a nightclub she owns, and lays out her idea. They assemble a team and away they go. It’s a shame there’s not much jeopardy: once the group has been established, the film is pretty much a series of daring steps, each one successful, building towards the climactic moment when the diamonds are snatched. The boldness is impressive, but there’s not much to feel other than admiration for their cunning; it’s pretty much a one-note film. James Corden’s appearance in the final act is fun: he’s a much vilified man, but I’m never really sure why. He’s always been a good actor, and he’s very funny here, with some laugh-out-loud lines that help to puncture the smugness that’s in danger of creeping in. All in all, this is an enjoyable way to spend a few hours; sadly though, that’s all it is. 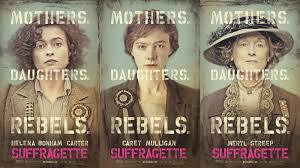 Suffragette feels like an important – and timely – film. There’s a bit of a feminist backlash going on at the moment, with cries of “feminazi” and “what about the men?” drowning out the fact that all feminists have ever really asked for is equality, which shouldn’t be too much to ask. 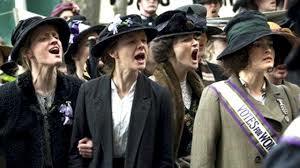 Suffragette brings to the screen the stories of the unknown women who fought the cause. The casting of Meryl Streep as Emmeline Pankhurst cleverly highlights this shift in focus: the most high-profile actor has a cameo role, as does the figurehead of suffrage. This film is all about the less-exalted stars of the women’s movement: working-class washerwomen like Maude and Violet (Carey Mulligan and Anne-Marie Duff) and middle-class professionals such as Edith, a pharmacist (Helena Bonham Carter). Their lives are tough and unforgiving, and they have little control over anything. Their husbands own their property, their children. No wonder they want something more, or at least the right to have a say. But, as ever, change is difficult to effect: the beneficiaries of the status quo are reluctant to let go, and others are afraid to rock their fragile boats. Here, we see Maude vilified and reviled as she begins to speak up for herself, and the reality of what she’s lost hits home – both for the character and the audience – when we see her son adopted because her now-estranged husband, Sonny (Ben Whishaw) thinks she will corrupt the boy. Sonny is bereft too: he’s threatened and undermined by Maude’s assertion of her rights; he’s a decent man who doesn’t understand. His tragedy is real as well. Everyone’s trapped by the rigidity of societal norms: Brendan Gleeson’s Inspector Arthur Steed feels some sympathy for the women, but that doesn’t stop him locking them up or allowing them to be force-fed.